Firstly, I would like to thank everyone for their thoughts, prayers, kind notes and gestures made for Tyson and for my journey. I know you’re all anxiously awaiting an update and I apologize it’s taken me so long. As you might imagine, it’s been a hectic few days here. My flight was fine…until I began throwing up about 4 hours before landing. Our son had gotten sick the day before at daycare and I must’ve caught whatever he had before I left. I had originally planned to head straight to Apollo (the hospital where Tyson currently is) but given the condition that I was in, I could hardly stand and did not want to risk passing it onto him. So, I headed back to Nu-tech. It felt like home when I walked in. I was so happy to see the sisters (nurses) and they immediately took care of me with a few bags of IV. I didn’t want to disappoint Tyson by not coming right away but he of course understood and the fact that he wasn’t upset made me believe that he was already feeling a bit more calm. The next morning, I woke up feeling much better, got myself together and headed over to Apollo with Ajo, (a member of the nursing staff who we jokingly call “Tyson’s brother” because they’re the same height and have beards 🙂 ). As I mentioned before, Tyson had been moved to ICU which was a ward with roughly 20 beds. I immediately noticed a large nursing staff, several doctors going from patient to patient and incessant beeping from all of the various machines. When we finally got to Tyson’s “room” (really just a bed w machines next to it, a partition on either side and a curtain as a door), my heart felt like it stopped when I saw him. 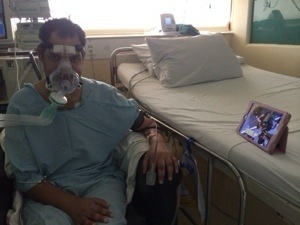 I was so happy to see him and I saw a huge smile under his ventilator mask which made me feel so relieved. I sat on the edge of the bed and held his hand and told him I loved him. I didn’t cry, it was just an overwhelming sense of relief to finally be there with him. I asked him if there was anything I could do for him and he slowly said, “just being here is all I need” and then asked me to put his hand on my belly :). His voice was a whisper and he was slurring his words at an average of one word every 2-3 seconds. He was completely coherent and was “with me” the entire day. I talked to him about Calvin and how all of our friends and RL family rallied together to get me to India in 24 hours. There was so much he wanted to say but struggled to so I just told him to wait. His mom and a few of the doctors caught me up to speed on his current condition as I sat holding his hands. Tyson was on the large ventilator, which does a majority of the effort of breathing for him. He had a small bi-pap machine next to his bed that he would use for an hour or two a day, as much as he could tolerate since this machine required most of the effort to come from him (sort of like a bicycle). The goal was to wean him off of the ventilator and onto the bi-pap machine. Once this happened, he could leave ICU and head to a private room. His co2 level was at 41 which was outstanding considering that it was triple that when Tyson was near death a few days prior. Also, they had stopped giving him food and water and replaced it with LTN which is basically liquid nutrition that looks like milk that was given to him in IV form in his neck. Tyson had been choking on food and when you do that while trying to swallow, the food goes in your lungs and can cause huge problems like pneumonia. This is called aspiration. I could tell he was beginning to heal. Not just by the stats and figures, but because I saw life in his eyes and the more we talked about the situation, I could tell he was calm and focused. Not scared. I stayed with him for 12 hours that day and returned to Nu-Tech after midnight feeling relieved and exhausted. Audrey had been there since the morning, so she left with me and then Dontay came to do the overnight shift. The next day when I arrived, Tyson was out of bed and sitting in a chair. He looked a little uncomfortable but it was a nice change from the hospital bed. Right away, I noticed that he wasn’t slurring. His words were coming out clearly; slow but clear. I had brought my iPad with me and since we couldn’t do much talking, I asked him if he’d like to watch a few episodes of “The Fresh Prince of Bel-Air” (thought it might take his mind off of everything). I half expected him to say no, but he nodded his head and said “yes!” So we watched a few episodes together and laughed. He immediately tried to tell me about the particular pair of Jordan’s that Will Smith was wearing (told me what year they came out and that he owns a pair 🙂 ). After a while, he asked to be put back in bed. He hadn’t gotten much sleep the day before so he was especially exhausted and relied on the ventilator nearly the entire day. He said he wanted to use the bi pap and I could sense a little frustration but I told him to just go at his own pace and that no one is rushing him. The next day, he did well with the bi pap; managed about 6 hours and his co2 was stable at around 42. By the end of the day Thursday, he had spent 19 hrs on the bi pap, only switching to the ventilator for a few hrs bc it was a quieter machine and he wanted to sleep. So Friday morning, his doctor , Dr. Rakesh Gupta had come in to meet with us as he did every morning and remarked on Tyson’s fabulous progress and improvement. We discussed plans to transfer him out of ICU. It was a bit of a gamble because once Tyson left ICU, the ventilator would not be available to him; he’d have to rely solely on the bi pap. If he felt he needed it, it would be another waiting game to get back into ICU to have access to the machine. The other side of this was that the longer he stayed in ICU, the more he’d be exposed to possible infections from other patients. Dr. Gupta said he wouldn’t have brought it up if he didn’t think Tyson was ready. I told Tyson the decision was his and he said that he was ready. So they began the transfer paperwork. Later in the day, another doctor came and spoke with me about purchasing our own bi pap machine since Tyson requires it to breathe at the moment. He explained that there are two basic options: one is to purchase the smaller bi pap and the other option he wanted us to consider was a larger machine that is a combination of both the bi pap and the ventilator. The latter suggestion came because the doctor felt that “with this disease, he will inevitably need the ventilator full time”. Such a shame that this doctor doesn’t understand Lyme disease and certainly doesn’t understand the power of Dr. Shroff’s stem cells. So I nodded and smiled and blew it off. Our plan is for Tyson to use the bi pap for as long as he needs and like with all of his other devices (wheelchair, hand and leg braces, etc. ), he will eventually no longer need them! Dr. Shroff concurred. I’m praying for you both! Stay strong both of you and stay in high spirits; the man upstairs has you in his favor. Ann you are such a ride or die and it’s truly inspiring. Please send Ty my love. Big hug and kiss to you both. So glad to hear Tyson is doing better; our thoughts and prayers are with you. I am sure you don’t know me, but Tyson may remember me. I am Scott Friers’ Mom; followed Tyson all along his high school basketball career playing against my Son from FFCS. I was good friends with Tyson’s Dad, Joe all during my high school years as well as his aunt Vickie. I also knew his Grandpa and Grandma Fowler as Cal worked for my Dad, Herbert Anderson on the State many, many years ago. I now live in the Utica area but Scott got me connected to you and Tyson’s story. He is a fighter as well as his whole family; give him my love as well as the entire family! I will keep following……..good luck Ty!!!! Soo glad to here he’s feeling a bit better. He’s such a trooper and I think he and Dontay owned avery pair of Jordans!! lol You are obviously his inspiration. Good luck to you all. Hopes and prayers.